Move and reposition your large plants easily with the Gardman Heavy-Duty Plant Caddy. 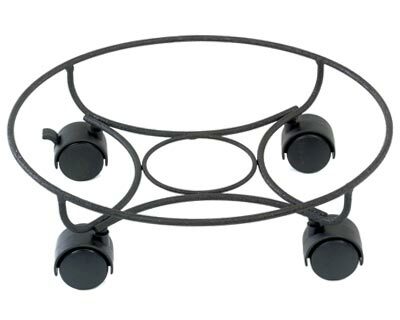 This round caddy can hold square, oval, or round planters with ease. The four wheels are connected to the caddy by metal support rods, which form a diamond pattern on the bottom of the unit, beautifully combining form with function. For safety, one wheel has a lock so the caddy does not accidentally move around. The wide base of this item holds any potted plant up to 13" in diameter, and the sturdy metal construction can hold several pounds. The durable epoxy finish can withstand years of use, and the black color accents any setting. Display your large planters indoors or out, and move them with ease using the Heavy-Duty Plant Caddy.